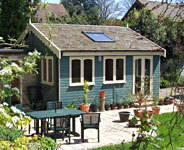 We specialise in the design, manufacture and full installation of garden buildings which cater for all needs and tastes, whatever your intended use or location. 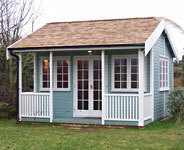 Our extensive range of garden buildings includes bespoke home offices and stylish studios, garden rooms, workshops, summerhouses, playrooms, sheds, garden stores, cabins and even beach huts, stables and aviaries. All the garden buildings in our range are purpose designed and built to order by our craftsmen using the best quality materials. 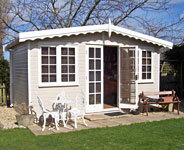 We provide enduring character, comfort and convenience with garden buildings which stand the test of time. All our garden buildings incorporate as standard many features that other manufacturers include only as extras - features which add strength and longevity to the building of your choice. As well as guaranteeing the style and quality of our handcrafted buildings, we also offer a 12 month guarantee on economy buildings, and a 5 year guarantee on all other buildings. With our simple, guided build-your-own process you can customise our bespoke garden building and workshop designs yourself to achieve the perfect match for your needs and location. For that additional touch of luxury, take a look at our range of hot tubs, developed by one of the world’s leading manufacturers and designed for ultimate performance even in the harshest of climates.